The next few days I'm traveling to North Carolina to visit DH's parents for passover and we're taking the LO with us. I'm crossing my fingers and toes that she'll travel ok on her first flight. It's about 4 hours long and she'll be sitting on our laps which I think will be more comfortable for her than the other options. She's usually a happy baby so I don't think she'll get too upset, but I worry about her ears. I'll let you know how it goes! 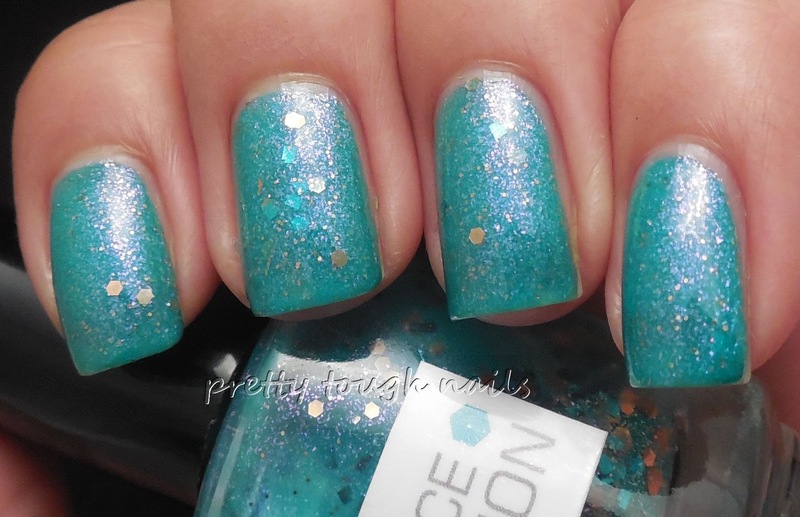 Tonight I have another favorite Nerdlacquer polish to show you, and this is Cyance Fiction. Just like the name, it's a gorgeous cyan blue cream base with a surprise pink iridescent shimmer flakes. I tried my best to capture it, but I photography skills failed me. I had no trouble with the application at all - I was expecting a little thickness but it actually had a thin consistency and went onto the nail really smoothly. 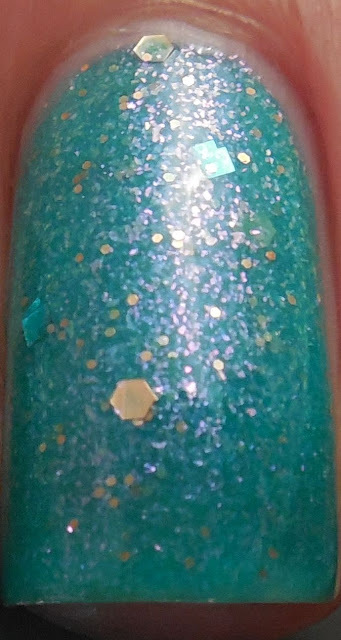 I love that this isn't a glitter bomb and that there is a small amount of gold hex and teal square glitters to accent the polish on the nail. I finished with a new topcoat, Essence Gel-Look Topcoat. It added a good shine, but I'll report later how well it holds up over the next few days. Gah, how gorgeous is that? I love this polish! I would wear this as long as I could but alas, swatching must continue. I wish I knew of similar polishes to this but I think Nerds have perfected this type of polish - great formula and no overwhelming glitters. Love!